Several weeks ago I received an invitation from Carmen at The Decorating Diva to be profiled on their wonderful site. The Decorating Diva site has a rich, in-depth level of content and I think they do the most in-depth an interesting designer profiles of any site around. 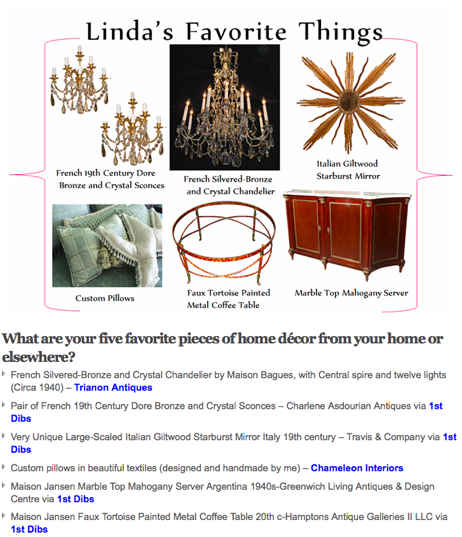 In addition to the usual history and work questions, they also asked me to provide a list of favorite design elements “Linda’s Favorite Things” below and my list of go-to sites for inspiration. So, if you have a moment, check out my interview on The Decorating Diva and then spend some time reading their entire site. A huge thanks to The Decorating Diva – I am so honored! Classic & beautiful. I think you deserve all of the above! Excellent sources listed – some I know and love and others that I can't wait to check out! You've impeccible taste and am delighted to meet some of your favorites! A new blog that I did not know about. Thanks for sharing. Please stop by my latest post about the before and after of our country home. this is so fun to read linda! Great interview, Linda! I also enjoyed seeing more photos of your work (and had not seen the second photo of your kitchen from a different angle–beautiful! ).